Hello! My next card is for the Color Throwdown. It came together pretty easy. All paper is from CTHM. 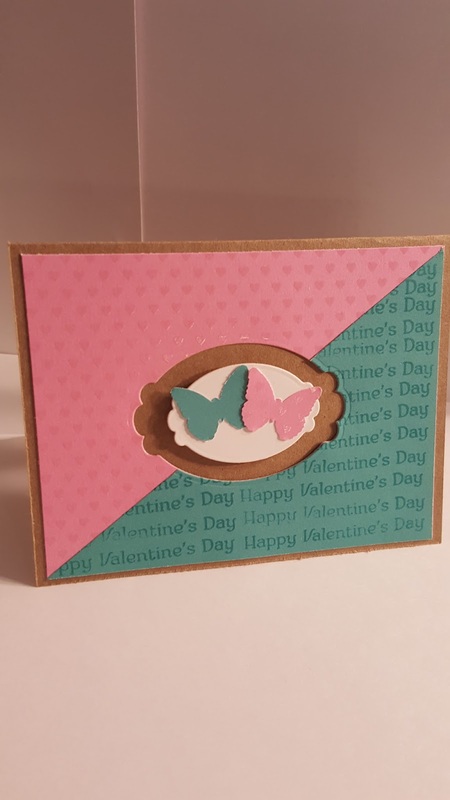 My card base is Kraft, I used the Whimsy Paper Fundamentals that has an embossed hearts. I also used Lagoon cardstock and repeatedly stamped my sentiment from the Say It All set in Lagoon ink. The die is from Spellbinders. Butterfly punch is from Martha Stewart. Thanks for looking! Great Valentine's Day design! Love how you stamped the sentiment to make your own patterned paper. Thanks for joining us at The Color Throwdown! Another birthday card today! This one is for Atlantic Hearts Sketch Challenge. I used paper from the Uptown Flair paper pack from the Paper Studio. I love the green and pink colors mixed with black in this paper pack. 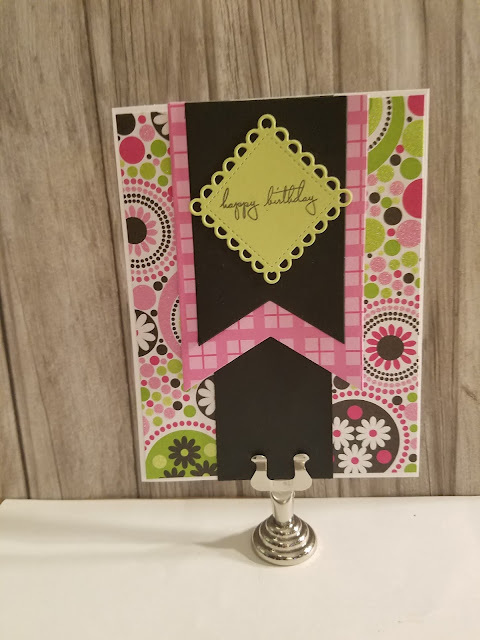 I used a Lacey Frames die from Verve to cut the square and set it on an angle to fit my happy birthday sentiment from Papertrey. Thanks for stopping by! Hello! 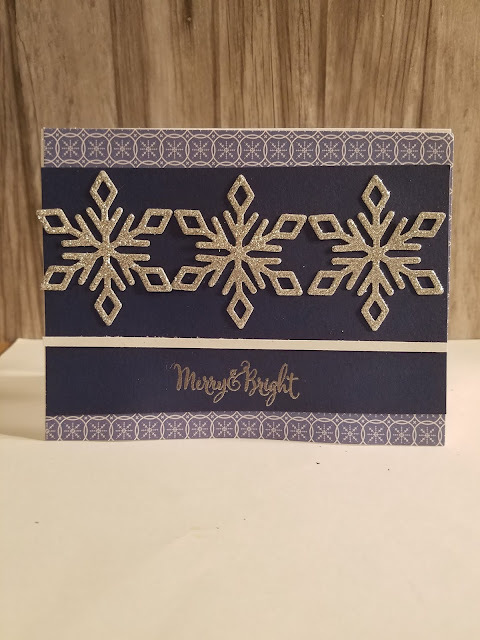 I have a card for Color Throwdown, I love the color combination blue, black and white. 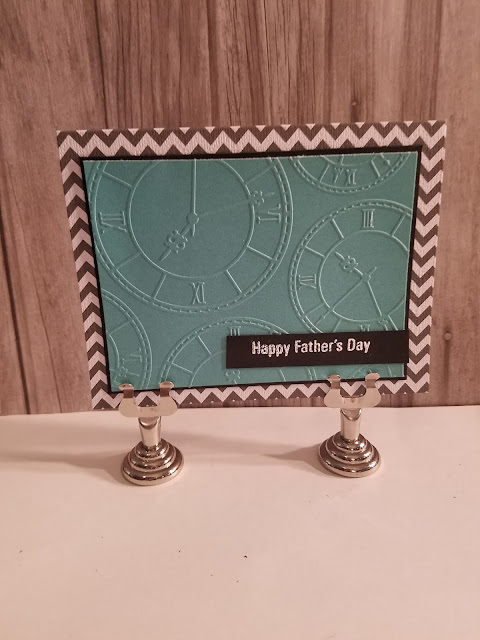 I actually started with a gray and white chevron card base from the Paper Studio. I have a small black layer with my main layer being Lagoon from CTMH. I embossed that with a clock embossing folder. Then I just added a Sentiment strip with Happy Father's Day embossed in white. Thanks for looking! The last assignment for My Favorite Things Summer School is on Symmetry. I used some pattern paper from DCVW. The snowflake is a die from Close To My Heart and it's cut from silver glitter paper. The sentiment comes from CTMH Just to Say set and is embossed in silver.